Bouden Coach Travel specialises in chauffeur driven car hire services. We offer the ultimate chauffeur car experience from start to finish. Both for business clients looking for an escorted travel service, right through to couples looking to have a special chauffeur car for a night out on the town. Our chauffeured vehicles include privacy glass, spacious seating areas, and, of course, a uniformed driver. Our chauffeur driven car hire services are yet another feature that makes Bouden Travel stand out amongst competitors. Get a quick quote for your Luxury & Executive Chauffeur Driven Car Hire Service. Call 0800 112 3770 to speak to a member of our team or CLICK HERE to fill out an online enquiry form for your chuaffeur driven car. We have specific luxury vehicles that we use for our chauffeur driven car services. The smaller saloon Mercedes E Class, as well as our brand new Mercedes S Class vehicle, is perfect for groups of up to 4 passengers. 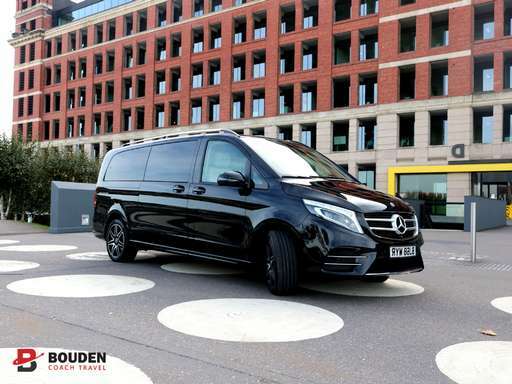 For larger groups of up to 6-8 passengers, we often use our Mercedes Vito Minivan and the new Mercedes V Class Minivan, which gives passengers extra leg room for extra comfort. These luxury vehicles are frequently used for executive business trips, special occasions and weddings in many countries throughout the world due to their amazing performance, style and unrivalled comfort. These vehicles are completely dedicated to passenger comfort and ideal for chauffeur car hire for VIP’s, special occasions and corporate events, which is why they are a preferred choice of ours. To arrange a personalised chauffeur car hire service, simply fill in our booking form. Whatever you need, let us know. We’ll review your chauffeur driven car hire details, and help you find the right vehicle for you. Call a member of the team to discuss the availability of specific vehicles today on 0800 112 3770 or click here to get a quick online quote.